Ayurveda, the science of life, presents a holistic approach to achieve, sustain and promote mental health. According to Ayurveda, mental health is “a state of mental, intellectual and spiritual well-being”. Mental Disorder Treatment In Ayurveda aims at establishing a balance between mind, body and soul through means such as balanced diet, exercise, meditation and cultivation of the right attitude. The concepts of Ayurveda introduce to us a number potent remedies and natural medications to restore balance and harmony of mind. How Ayurveda Classifies Mental Disorders? Ayurveda links mental disturbances with the accumulation of toxins (Ama) in the body. Clinging on to negative emotions and not being able to vent them out results in this accumulation. To get rid of such conditions one should be able to contact one’s own mental awareness, bring it into balance and channelize that balance to the body. Ayurveda recommends several powerful methods of managing mental health. 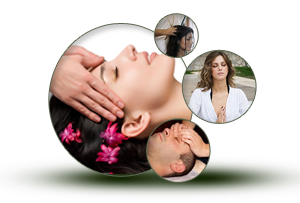 These remedies combined together work in the direction of correcting the imbalances in the state of mind. Dincharya (Daily-regimen) - Our routine has a deep influence on the state of our mind. Getting up with the sun, eliminating the toxins, cleaning the body and beginning the day with worship promote purity in mind, body and emotions. Selection of right food according to body type, utilizing the time in the right manner and staying away from self-indulgence all contribute to a balanced state of mind. Meditation- It is the first and last medicine of Ayurveda and is the path for self realization. Any Ayurvedic Treatment Programme is incomplete without Meditation. It teaches one to rise above that actions and reactions of mind and be experience the stillness in self. Herbal Preparations- Herbal preparations termed as “Medha Rasayanas” stabilize mind. They nourish the neurological tissues and raise the levels of intellect. They are potent remedy for biological nourishment of the brain and to improve memory, concentration power and peace of mind. There are many more powerful remedies described in Ayurveda that aim at restoring one’s mental health. Clink HERE to find the different mental disorders and the herbs, yoga, ayurvedic medicine use to cure mental diseases. At Pure Herbal Ayurved Clinic, Dr, Gurnam Singh Saini and Dr. Pooja Saini have been providing life-changing consultation to patients suffering form mental disorders. You can book your appointment and get personalized Ayurvedic Solutions tailored to meet the requirements of your body constitution. Be it any condition, depression, mood swings, anxiety, stress, phobias, panic attacks, Obsessive compulsive disorders or any else, you leave fit and fine from this healthcare centre.